Where I Am Now: Will the Alki 11 Rowhouses Cause Flooding? Will the Alki 11 Rowhouses Cause Flooding? If you've been following these posts for a while, you are familiar with the math: for every inch of rainfall, nearly 5500 gallons of stormwater will come off the roofs and paved surfaces of the Alki 11 rowhouses and be piped into the combined sewer system. You are also familiar with how this volume of stormwater can contribute to sewage overflows into Puget Sound. Now let's look at how this project can cause flooding. 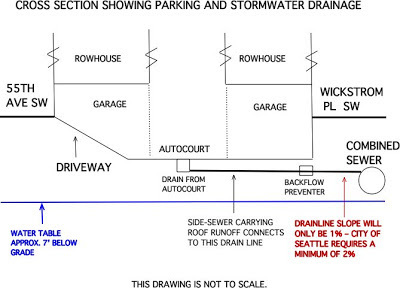 The drawing below shows, in general terms, how stormwater drainage will be handled. Note that the garages will be partially underground (the entrance/exit from the parking area will be on 55th Ave SW). The only way stormwater can get out of the parking area is through the drain in the center of the autocourt. To get an idea of what 5500 gallons of stormwater would look like, consider this: a standard bathtub holds 50 gallons of water. So one inch of rainfall would produce the equivalent of 110 bathtubs full of stormwater. We don't often get an inch of rain in a day, but a big storm can easily drop half-an-inch on us, which would mean 55 bathtubs full. Add that to the 80 gallons of waste water per person per day (2,640 gallons or another 53 bathtubs full) that will be generated by this development and that's a lot of volume going down the drain in a single day! 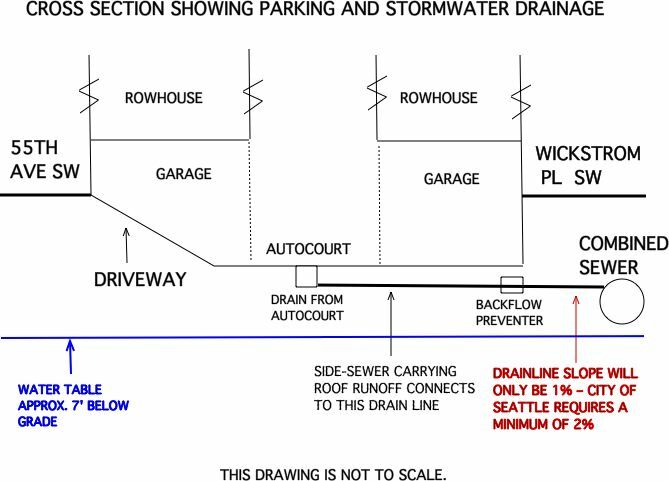 "...stormwater from roof, footings, and pavement areas will be collected in an onsite storm drainage system and discharged to the 8-inch combined sewer pipe located in Wickstrom Place SW.
Due to the elevation of the garages, driveway, and autocourt, the discharge pipe to the combined sewer line needed to be designed at 1%. A Hold Harmless Agreement will be recorded since this pipe is under 2% as required by the Side Sewer Director's Rule SPU DR 2011-004/DPD DR 2011-04. Likewise, we were unable to design to storm outfall pipe at 1' above the crown elevation of the sewer main at the property line, so we are providing a backflow valve for this pipe as required by the Director's Rule cited above." I asked an attorney and a structural engineer to explain the Hold Harmless Agreement in this situation. Both said that since the sewer connection is out of compliance with city requirements, the developer is agreeing to assume financial responsibility if a problem occurs. Ominous, considering that the developer is doing business as a Limited Liability Corporation (LLC), and that buildings have a typical design life of something like 75 years. Will his company assume responsibility for damages over the life of the project? Seems doubtful. Developers often form separate Limited Liability Corporations for each of their projects. When a project is finished and the last unit is sold, they dissolve the corporation. When the LLC disappears, who is responsible then? The owners of the rowhouses? Or will it come back on the city, despite the hold harmless agreement, because officials were negligent for allowing this sub-standard sewer connection to be installed? These are questions that need to be answered. So what are the implications of this improper sewer connection? For one, drainage will be slow under the best of conditions because the stormwater drain will be almost level with the sewer line. Any amount of sediment that accumulates in the line from roof and autocourt runoff will slow drainage even more. The backflow valve will prevent sewage and stormwater from flowing back into the drain line, but if there is a big storm that sends a lot of volume into the system all at once, it's easy to see how that 8-inch sewer pipe would be overwhelmed and stormwater would back up in the garages waiting to drain. Where else can it go? Secondly, the combined sewer line mentioned in the engineer's report is the wild card in any discussion of how much volume can drain at any given time. Wickstrom Place SW is at the base of a steep slope. Underground streams flow off this slope year around, especially during the rainy season. This water carries sand and silt which washes into the storm drains along the street. As a result, the sewer line always has some amount of sand in it, which reduces the volume of combined sewage it can carry. The city pumps sand out of it from time to time, but during the rainy season it accumulates quickly. To get an idea of how much sand there can be, I talked to a neighbor on Wickstrom who had a sewer camera inspection done earlier this year. She says that the drain from her house to the main sewer line was in pretty good shape, but the technician couldn't get the camera into the main sewer line because it was so clogged with sand. There are only two maintenance holes on Wickstrom where the city can access the sewer line to clean it out (see sewer map here). One is at the end of the street where it dead ends at the edge of the bluff and the second is where Wickstrom bends to join 54th Ave SW. There are 5 storm drains (two on the street and three on private properties) that empty into the long stretch between maintenance holes. I doubt if there are backflow valves installed on those storm drains. So if the system is overwhelmed with waste/storm water and the sewer line is clogged, the overflow will escape through those storm drains and into garages and then into the street. Where else can it go? Third, our climate is changing. We are beginning to experience heavier rainstorms with greater frequency. A few days ago, a storm estimated to have delivered between 0.20 and 0.50 inches of rain caused major flooding at both the Westfield Southcenter Mall and Bellvue Square Mall. It isn't far fetched to imagine that the quantity of stormwater the Alki rowhouses will dump into our sewer system will do the very same thing. Big storm = half an inch of rain = 55 bathtubs full of stormwater coming off the Alki 11 Rowhouses into a clogged sewer pipe = high probability of flooding. The Alki 11 Rowhouse project needs to go back to the drawing board. It is too large a project on too small a piece of land. Hyper-density should be accompanied by hyper-mitigation of environmental impacts. This project should be redesigned to provide space to manage all stormwater runoff on site. It should provide adequate, usable parking so residents don't have to park on the street. The number of housing units should match the carrying capacity of the waste water infrastructure. The 53rd Ave Pump Station was recently upgraded to increase the volume of waste/storm water it can handle by 2 - 3 times, but this project increases waste/storm water volume 8 times over what it has been historically. This is not sustainable development. Over One MILLION Gallons of Wastewater - Where's It All Going to Go? How Much Sewage Will the Proposed Alki 11 Rowhouses Generate? We Have A Meeting Date!